For ten years, Doran Brown had been the sole operator for a tile-drain cleaning business, working in the boggiest parts of southern Southland. When David Kean bought that business this year, and took Doran in as a 50/50 partner to form South Spray (2018) Ltd, they needed a new tractor to ease the load on a JCB FASTRAC 3220 in which the latter had clocked 11,000 hours. The 3220 had proved its worth in its home district many times. With four-wheel drive, four-wheel steer and, most importantly, independent self-levelling suspension (unique to JCB tractors), it enabled Doran to work in places no other tractor – and certainly no truck – could touch. As far as Doran was concerned the choice of the next tractor was a 'no-brainer'. And so the business bought a new 235-horsepower JCB FASTRAC 4220. In partnership with a local engineer, David Kean is the second-generation owner of Farmers Dipping Co, based in Central Southland, which over the years has evolved into a dipping and spraying business now running ten spray rigs all over Southland as well as still dipping 200,000 sheep each year. Meanwhile Doran Brown had also been doing some spraying in his area, to which his FASTRAC 3220 had also proved ideally suited. So when the two teamed up, they decided to confine the now-ten-year-old 3220 to tile cleaning only and to introduce the 4220 for spraying. The 4000-Series FASTRAC is a more advanced design that further improves the JCB-trademark features such as multiple implement mounting points for optimum tractor utilisation, fast field and road speeds with more sophisticated all-round suspension and braking for stability, safety and comfort. They purchased it with a mounted AMAZONE UF 1501 spray rig equipped with an 18-metre boom. This rig has a 1500-litre tank, plus an AMAZONE FT 1001 'front pack' that adds a 1000-litre tank to the front of the machine. 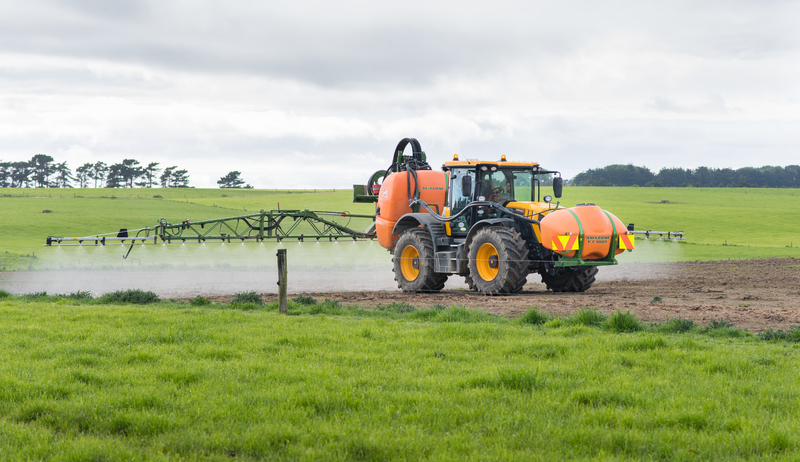 To maintain stability in work, the AMAZONE UF 1501 spraying system depletes both fore and aft tanks at the same rate. In spraying work, the tractor's suspension enabled faster ground speeds without bouncing the spray rig around. Doran can spray at around 26 kph – while the tractor's wheels are bouncing over paddock undulations, the spray rig remains quite still, and stays at the same height above the ground at all times. This reduces wear and tear on the gear and is also kinder to the operator: once, when the old JCB was out for maintenance Doran was obliged to use a hired tractor of another brand and he developed a sore back. When the JCB returned to work, the back issue disappeared. Tile-cleaning calls for a machine that can carry a 2000-litre water tank with a hose in any conditions. "The 3220 will go forever on the drain cleaning because it's only shifting from farm to farm," says David. David, who is currently president of Rural Contractors NZ, says: "I've met people who are passionate about their particular brand of tractor, but Doran just loves JCBs. And he has every reason to because he's spent 11,000 hours on one. "When he drove that other brand he found it uncomfortable and not as stable as the JCB on the contour that he works. He just said: 'I want another JCB'. "And I wanted the best machine for him. He's the one who gets out of bed, the one the clients ring. He's got a good name and a good work ethic. He has to work during the night sometimes because the weather gets better for spraying at night and he's been doing that for the last ten years." "He goes into some tough country down there. To get that machine bogged you've got to be in a really, really wet paddock. If one wheel falls into a wet spot, with the four-wheel-drive, and limited-slip diffs, the tractor just keeps on going. With its 50-50 weight distribution, you've got even weight all round so your ground compaction isn't right at the back as it would be with a conventional tractor." This latest purchase brought another huge benefit for both operations. David could locate a highly capable spray rig in the southern Southland district while Doran did not need two hours of downtime to swap the tile-cleaning gear for the spray rig. "He often needs to do that in the middle of the day, especially when the weather is due to change. When he can't spray, he can clean drains."